As an adult with a curious mind, I finally gained an interest in reading because I developed a passion for learning. Early in my career, though, I was that person who said, “I don’t have time to read.” I wanted to; I just didn’t see how I possibly could with everything else going on in my life. But, one day I figured out that I just needed to make the choice to incorporate habitual reading into my life and the time to read would present itself. This one change generated positive ripples in so many areas of my life. It was the genesis of my becoming a student of all the subjects that interest me. Reading more and more often enabled me to grow my business, help others by sharing my expanding knowledge, and become a better parent, spouse, and overall person. What changed? I certainly didn’t buy an extra thirty minutes each day – although that would be super cool. 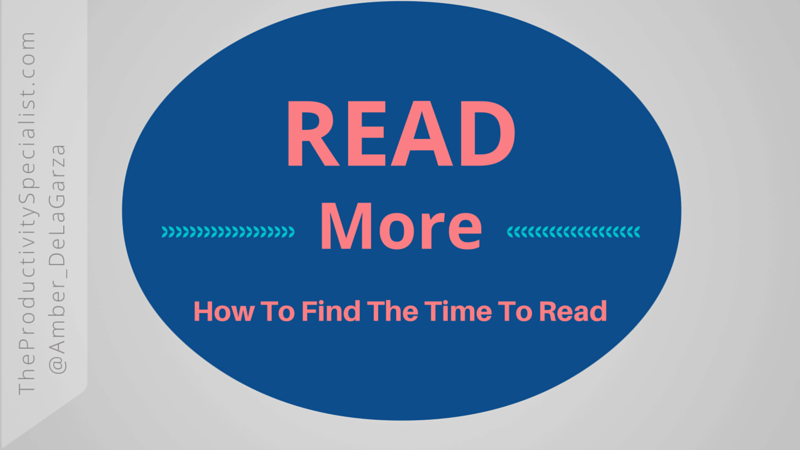 New clients often tell me they want to read more but can’t find the time. I help them find the time they crave to read and I promise it’s not hiding. You too, can read to your heart’s delight. Never having to think “I don’t have time to read” ever again starts with making a simple choice. Have you actually chosen to read more? You can’t just want to read more. You have to make the choice to read more. Wanting is just wishing for something to come true and never putting any muscle into making it a reality. Until you make the conscious choice to regularly read more, no tip, strategy, app, or technique can help you do so. Honestly, how much time do you spend watching TV, mindlessly surfing the internet, chit-chatting with associates, or scrolling through social media posts? The time you desire to read more is abundant if you look for it. You may just have to give up the mass amounts of time you spend engaging in other activities. Stealing five minutes from Facebook here and 30 minutes from Seinfeld there can add up to ample reading time. To find time to read more you must identify where you’re currently investing your time. You may not like what you initially discover. Several years ago, let’s just say my results fell into the WAY too much of the Mindless Activities category. None of those activities were bringing me any closer to achieving my goals or vision of success. I was spending valuable time on those activities yet not receiving a great amount of satisfaction from them. I decided to trade some of that wasteful time for valuable reading time. To be successful, I had to let go of the notion that reading meant book in hand, curled up on the couch, hot cup of cocoa in hand. As a busy wife, mom, business owner, daughter, and friend, that dream scenario was just not going to happen as often as I would like. I changed my mindset to understand that reading could be done anytime, anywhere. I lessened my social media activity, Law & Order watching, and Pinterest scrolling and found all sorts of time and energy to read (notice I said lessened, not gave up). Search your everyday schedule and see where you can substitute activities for reading more. Driving – If you ever drive a car, then this secret is for you: driving is the perfect time to read! Companies like Audible produce digital audiobooks that you can listen to while driving. Your eyes need to remain focused on the road but your ears can listen impeccably well while driving. It’s just like listening to talk radio, except you only listen to topics that YOU choose! Idle time – We all have idle time, often between appointments, riding in a car as a passenger, waiting in lines, and anyplace else we find ourselves thoughtlessly checking social media for updates. Put that idle time to good use and read! If perusing blogs and online magazines is your thing, try Feedly, a phone app that updates any blog or online magazine you subscribe to all in one place in a reading library. Waking Up – Reading first thing in the morning right after you open your eyes has the potential to fuel your creativity and set you up for a productive day. Reading on my Feedly app first thing stimulates my mind and helps me wake up without feeling groggy. Instead of your alarm prompting you to check all of the notifications that came through while you were sleeping, try reaching for a book or other industry publication. Getting Ready – Your morning routine may be only 10 minutes long or possibly 60 if you’re a woman who curls her hair daily like me. Either way, you certainly have that routine down pat and therefore perform it on autopilot. What a great time to put your otherwise idle brain to work and read more! You can easily listen to Audible or TED talks via the app while brushing your teeth, shaving, showering, applying makeup, or whatever it is you do in the privacy of your home each morning. Falling Asleep – Are you in the habit of mindlessly watching TV in bed to lull yourself to sleep? It certainly helped me wind down on numerous occasions in the past. According to research by the National Sleep Foundation, about two-thirds of 30 to 65 year-olds watch TV every night or almost every night within the hour before going to sleep.Try reading yourself into that state of peaceful slumber every night instead. Taking a Break – I strongly encourage taking breaks. When you return to your work refreshed after a short break, you will do so with renewed focus and a fresh pair of eyes. The secret is to make some of your breaks purposeful and productive. Sometimes a Kit-Kat and Facebook break is called for. I get it. Doing business can be stressful! Other times, use your break to read more. During my breaks, I often choose to catch up on the non-time sensitive emails saved in my *To Read Folder, reading articles on Feedly, or watching part of a recorded webinar. If you purposefully make reading a part of your day consistently, you will find an abundance of time in which you can read. Over time, reading will become a ritual that you naturally incorporate into your life and benefit from! Books, magazines, cd’s, and the internet are full of knowledge and advice that can teach you how to produce better products, provide superior service, improve your marketability, and take your business to the next level. Don’t forget to slow down and re-read a book you really want to marinate or to take a break from reading so the ideas you just read have time to percolate. Reading is not just a means to check a book off a list; it is a method by which we can improve our thinking and behavior. So invest in yourself and get out there and read more! Commit to utilizing one break from work each day for reading.